Emily Ratajkowski, 27, was mercilessly trolled online for going bra less underneath a white tank top during a protest against the nomination of Judge Brett Kavanaugh to the Supreme Court in Washington DC last month. Now, the glamour model-turned-activist has hit back at her detractors, insisting that she attended the march for political reasons rather than to make a fashion statement. 'I knew being there would be important and I knew some people would find it controversial, but I never expected anyone to talk about why I wasn’t wearing a bra under my tank top,' the Maxim model told Stellar magazine this Sunday. 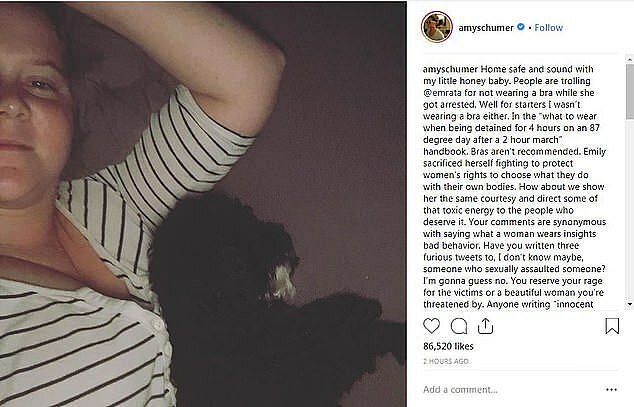 Emily, who was arrested at the protest along with fellow star Amy Schumer, explained that she believed her outfit seemed 'completely normal' at the time, given the sweltering Autumnal temperature. 'And I was there making a political point. Why would people focus on what I was wearing?' the Gone Girl actress added. 'Your comments are synonymous with saying what a woman wears insights bad behavior,' she continued. 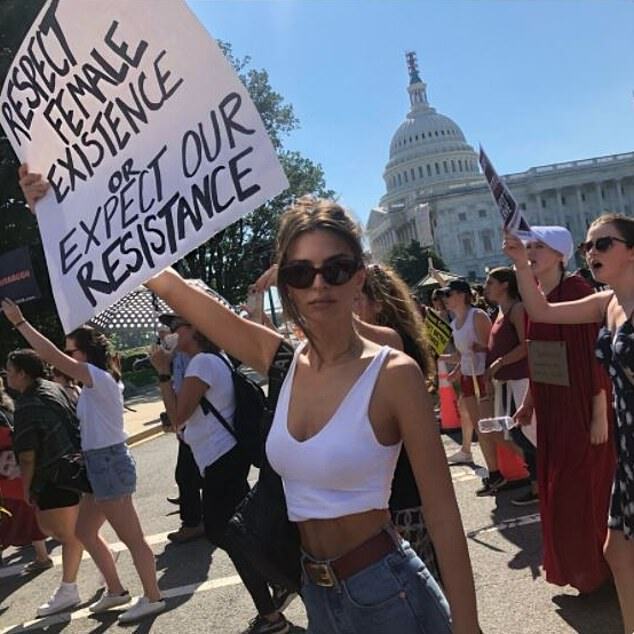 Emily joined about 300 others to protest the nomination of Kavanaugh early last month, holding a sign that read: 'Respect female existence or expect our resistance'. She shared news of her arrest on Twitter, accompanied by a picture of herself at the rally. 'Today I was arrested protesting the Supreme Court nomination of Brett Kavanaugh, a man who has been accused by multiple women of sexual assault,' Emily captioned the image. 'Men who hurt women can no longer be placed in positions of power,' she wrote.